The past few days I’ve been pulling some content together for a couple of workshops I’m doing at the ASTD TechKnowledge conference in San Jose. The workshops are for those who are just getting started with the Articulate tools. I only have about 75 minutes for each workshop, so I am pre-building most of the course that we’ll use for a few practice activities. The participants will get all of the assets and some job aids to help them during the practice activities. You can see how I’m designing the activity job aids below. They’re pretty simple and work with what we’ll be doing live. I also added links to Screenr videos and embedded some tutorials because it’s easy to get lost during the conference sessions. This way the participants have access to some quick tips while they’re working on the files and can work at their own pace. In case you’re interested in how it looks, you can download the PDF here. The file is about 20 MB because of the embedded video. If you want to use the template, feel free to download the basic PowerPoint file that I used to create the job aid. Use it as you wish. Working on the mini course reminded me of some of the challenges many who read this blog face. The main challenge is working on one or two-person teams with a budget of $12.37. So I thought I’d share a few ideas on how to squeeze as much as you can out of those twelve dollars. One of the biggest challenges we face is coming up with the right look for our courses. It’s really hard when you work by yourself and you’re not a graphics designer (and you don’t have access to one). So how do you get a course design idea? The easiest thing is to work with what you have. In the course I am designing for my workshop, I need something simple. I’m not that concerned about the course content, but I do want something that makes sense and looks nice. Many times I’ll look for practice content on government sites. But not for this course. One of my favorite gadgets is my Keurig coffee brewer. When I unpacked the box, one of the things that impressed me is the “getting started” card (and the overall packaging of the documents) that they provide with the brewer. It has the feel of being a high-end product. Bonus tip! There’s a lot to be said about the aesthetic of your course design and how people feel the first time they SEE it. Is your course inviting? Or does it just look like a bunch of PowerPoint slides and clip art slopped together? Another Bonus Tip! Keep it simple. You don’t need to dump everything you know on an unsuspecting learner. Compare the brewer’s complete manual to the quick start manual they provide in the box. Which is more inviting? I decided to use the information on the “getting started” guide for my practice course. The content is simple and the illustrations are very elegant. They’ll look great on the slides. There’s probably a lot of existing content and assets available in your organization. It’s just a matter of finding it. In my case, I started with the Keurig documentation. It comes with some basic content. Essentially it’s a mini training document. So there’s good content and a nice flow to how the information is structured. An added bonus is that the documentation includes some really high quality images. I can easily use them in my elearning course. I also did some searching online and found all sorts of demonstration videos and images that I could use. Initially I was going to design my course to look like the getting started PDF. The design is simple and the flow of information would have worked well with that type of design. 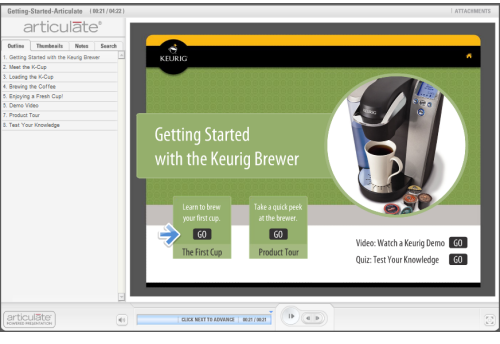 But I wanted something a little richer, so I used the Keurig web site for inspiration. Click to view the demo course. If you preview the draft version of my course above, you can see that the web site provided a lot of inspiration on how to present the content. What I like about this particular design is that it comes with a rich color scheme. So I don’t have to think of that myself. I’m not a graphics designer and my use of color isn’t always great. Being able to start with someone else’s design is big plus and timesaver. Company brand: branding in elearning courses is a big issue for many organizations. I’ve written a little about that in the past. Those that tend to make it an issue usually have some sort of branded identity. Use what they have to inspire your design. 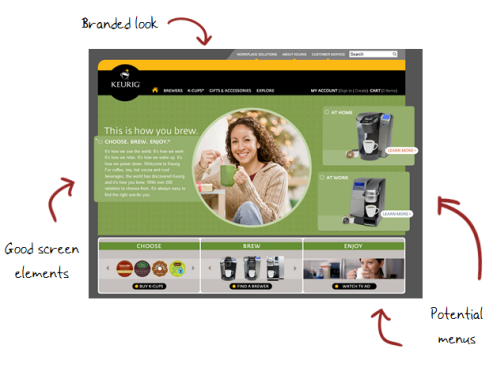 Screen layout: I really like the way the Keurig site looks. It’s inviting and there are many elements in the web design that I can incorporate in my own. For example, you’ll notice that I used the big, picture-circle in all of the screens. It’s a nice visual element that ties all of the screens together. 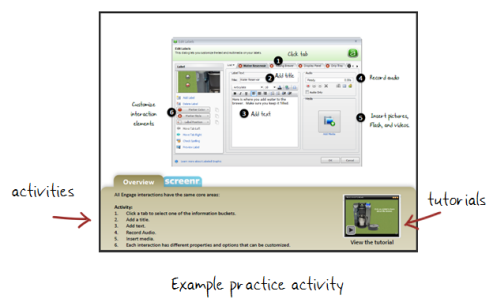 Menus: I like to create visual menus that the learner can click to jump to specific parts of the course. So when I look for inspiration, I try to find those areas that could be used as menus. In my practice course, I used the light green boxes. But I like the way the gray boxes at the bottom look. Those would also make nice menus. Once you have the design and some assets it’s easy to pull the course elements together. For example, I built the demo course in about a day. I was able to do so because I had a good starting point. 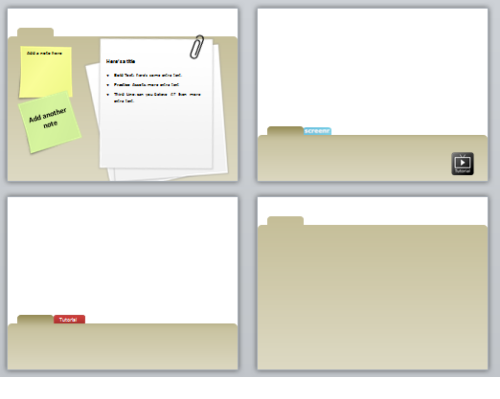 I used the web site for inspiration and then I did some screen grabs of the images in the .PDF. Then I cleaned the images up a bit to work with the course. Another thing to consider is that you can pull things apart and use them in new ways. 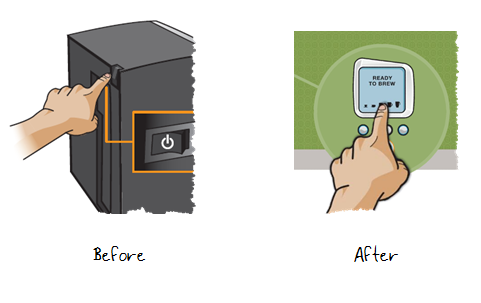 For example, I pulled the hand image out of the PDF and used that as an animated pointer to highlight the brewing process. As you can see, with a little sleuthing it’s easy to find inspiration inside your organization. I know that there are some who will say that this won’t work for them because their company’s stuff isn’t very good. That’s OK.
Just go out and find a site you like. Use that for inspiration. And then apply your organization’s brand and colors to the design. Here’s a post I did a while back that shows how. Plus, you can download a bunch of starter templates. What do you do to find inspiration for your course design? Share your thoughts by clicking on the comments link. Are Your E-Learning Courses Going to Land You in Jail? Congratulations for your victory, Tom!! I always LOVE what you do. You have made me LOVE designing courses! Love your blog! I too get inspired by other things I see. In your post you say you use other site’s images/colors/designs…silly question, but aren’t you concerned with piracy or copyrights? Hi Tom. I’m just getting started with Studio 09. The animations in your demo (Getting Started with . . .) are awesome. Any chance you might share the PPT file with us? @Marcelle: when’s ISTE? I’ll be in Austin later this year at SITE. @naonah: good question. I don’t advocate stealing another person’s ideas. That’s why I acknowledge where the design ideas come from in the first place. Also, you’ll notice that the designs are inspired by the sites, but not exact duplicates. My ultimate goal is to help people who have limited experience practice some production techniques to become more fluent with the tools their using and more experienced in thinking about how they use the screen’s layout. @rxmeds: I’ll be sharing the resources after the TechKnowledge conference. Tom! Iste is June 26-29, 2011 in Philadelphia, PA. I have a question about the pdf. We have shied away from putting embedded swf files into a pdf because every time we do, we encounter a security issue where the user has to click a button before watching this video. But I noticed on your pdf that this security issue does not exist. Please, please, please tell me how you did it!! I guess it’s more popular in Europe? @Mitch: I used Acrobat and embedded an MP4 and not SWF. I didn’t change any security settings so it must be a default setting. Also, it maybe that you still get the warning, but it’s disabled on your PDF reader. I did get the warning on my test PC. Hey Tom! With all the freebie templates and great tips on where to find inspiration, I can save my $12.37 for coffee! Thanks for the template. Thanks for all your inspiring ideas all year! Question: How do you do a “screen or image grab” from a PDF? Thanks. @Janet: there are a few ways to do screen garbs. Snagit works but it’s not free. Do a search for Snagit alternatives. 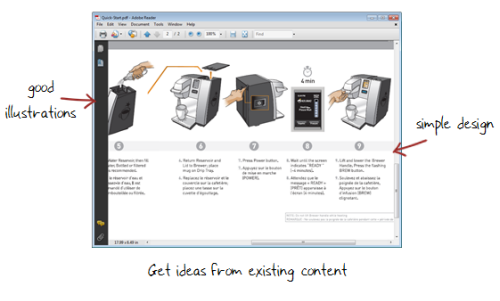 You can do the old “print screen” and then paste into PowerPoint or Word and crop the image. PowerPoint 2010 has a screen capture feature. There are a lot of screen capture features built into browsers (not sure if they work on the PDF plated through the browser though). @ Janet: May be you should try FastStone Capture! Not sure if its free..but our team uses it and its quite good. You said you cleaned up the images. 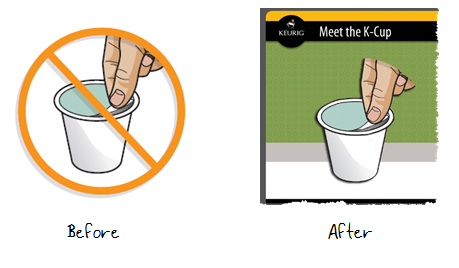 How did you remove the orange “no” symbol from the picture of the K-cup? What program did you use? @Therese: you can use any image editor. I used fireworks and just erased the cross and repaired where it was blank. Great post as usual Tom! I love the idea of looking at other sites for inspiration. I too love my Keurig brewer and found this great site http://www.coffeewiz.com/ if you order $50 worth of coffee, the shipping is free! I found this post very helpful, as well as the older one that you linked to . . . and then some other olders ones that were linked in there. In fact, I just spent most of the day watching tutorials and getting ideas for the new Onboarding program that I am developing. Thanks! I Love your blog! I really get inspired by other things I see. I have learn that collor has a big influence in our sites!! I think what you do is really important, Thanks for the good guidence! Nice work Tom! I have bookmarked your blog and will visit often, I have found great insight from you and also from the comments that have been posted here..
Nice info shared! e learning course designing could be hard part from designers prospects, it is the first impression for student to get interacted with their course material. Its overall presentation should be interactive and interesting to make students feel comfortable with learning.